Well-regarded in the industry for reliable gene expression, SBI’s lentiviral vectors come in a variety of formats that support a wide range of applications. 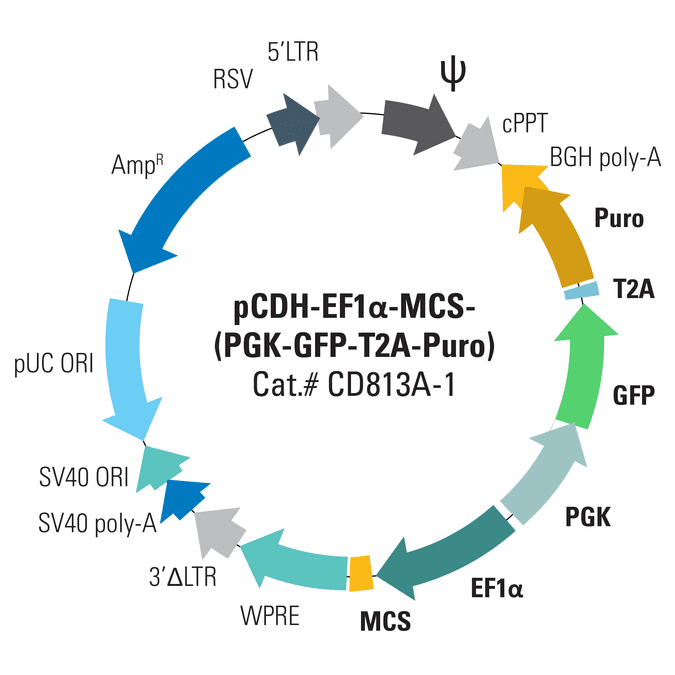 The pCDH-EF1α-MCS-(PGK-GFP-T2A-Puro) Bidirectional Promoter Cloning and Expression Lentivector gives you another option for robust, coordinated expression of your gene-of-interest and co-expressed GFP and puromycin resistance via a T2A element. This promoter configuration takes advantage of the natural bidirectional activity of the PGK promoter, and this divergent configuration is both stable and resistant to silencing in embryonic stem (ES) cells, trophectoderm stem (TS) cells, and extra embryonic endoderm (XEN) stem cells1. Golding MC and Mann MR. A bidirectional promoter architecture enhances lentiviral transgenesis in embryonic and extraembryonic stem cells. Gene Ther. 2011 Aug; 18(8):817-26. PMID: 21390068. Sample data showing effective transduction with SBI’s Bidirectional Promoter Lentivectors. HEK293 cells were transduced with pCDH-EF1α-MCS-(PGK-Puro) (Cat.# CDH810A-1, upper left panel), pCDH-EF1α-MCS-(PGK-GFP-T2A-Puro) (Cat.# CDH813A-1, upper right panel), pCDH-EF1α-MCS-T2A-RFP (PGK-Puro) (Cat.# CDH822A-1, bottom left panel), pCDH-EF1α-MCS-T2A-GFP (PGK-Puro) (Cat.# CDH823A-1, bottom right panel). After four days, cells were imaged—the high number of cells present after puromycin selection (upper left panel) and cells showing GFP or RFP signal (all other panels) demonstrates the effectiveness of this lentivector family.